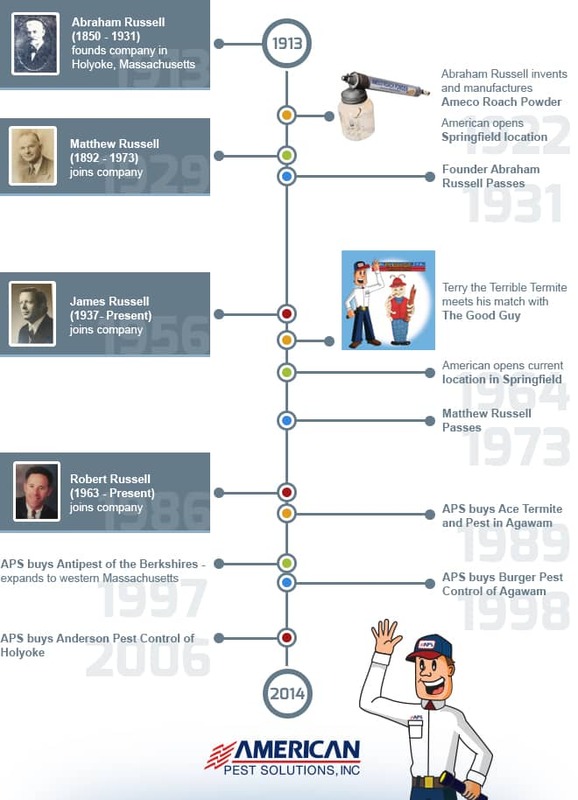 Abraham Russell founded American Pest Solutions in 1913. In 1929 his son Matthew joined him. That same year, the company incorporated and moved to 1421 Main Street, Springfield, Massachusetts. Matthew headed up American for 37 years and in 1956 his son James joined the company after completing his college studies. Jim took over as President in 1971 and has run the company since then. Jim Russell has received many civic and industry awards while in this position. In 2005, the National Pest Management Association selected Jim to be the 13th recipient of the Bart Eldridge award. That is the highest award given to a pest management professional by the NPMA. In 1986, Jim's son Robert became the fourth generation to join the company. By this time, American had moved to its current location at 169 William St. in the south end of Springfield. General offices, the service department, warehouse, and garages are all located at this address. Bob was appointed to the position of President in 1995 and in 2005, Bob became a Board Certified Entomologist. American continues to be a leader in our field, and in the community. In March of 2006, American Pest Solutions was honored for it's 60th year as a member of the Better Business Bureau of Central New England. Jim Russell, a past president of the BBB, is quite proud of this honor. Why choose American Pest Solutions over the others? We're local. Our company started right here in Springfield over 100 years ago. Four generations of the Russell family have kept this company growing since we began. We're not a national conglomerate or someone who started working in this area 10 or 20 years ago. We're involved. Most consumers would rather do business with a company that is a long-time member of the local business community, and one that has a great reputation. American has been an active member of the Better Business Bureau of Western New England for over 60 years! Feel free to call the BBB and ask about us. In addition to being a past president of both the BBB and Springfield South End Business Association, Jim is a member of Rotary International. He is also a Shriner, and President of the local chapter of Therapy Dogs International. We're responsible. All our employees must pass extremely rigid background checks before they are hired. That includes drug screening. Every single field representative of our company will do their professional best to make you happy with our services. Our office staff receives nothing but complements from all our customers and potential customers. They are extremely knowledgeable and will do their utmost to answer any questions about services, products used, scheduling, and payment options. We've got the solutions. Our company President, Bob Russell, is a Board Certified Entomologist, and a member of the Entomological Society of America. Not many companies in our industry have an on-staff entomologist. If you discover a pest that you can't identify, take a picture of the specimen then email the picture to us along with a brief description of where it was discovered and anything else you feel might be pertinent. We'll respond as soon as possible with a confirmed identification as well as our professional opinion of the proper treatment options. We're licensed & certified. At American Pest Solutions, we're proud to have been recognized by the NPMA as a QualityPro certified company. Our pest control professionals are licensed and certified in both Massachusetts and Connecticut. Our company is an active member in both regional and national pest management associations. All our employees attend yearly recertification training and seminars to maintain their licenses. Our resident Entomologist also conducts additional classes in our facility on a regular basis. We're an IPM provider. American Pest Solutions was a pioneer in the use of Integrated Pest Management (IPM) techniques. We actually used the legislated model before it was passed into law. We're especially familiar with dealing with IPM issues in schools, daycare centers, and even colleges. We follow IPM guidelines, and try to resolve issues in the most environmentally responsible manner. We will gladly work with your IPM Coordinator and Committee to implement a state-approved, certified Integrated Pest Management program.